“Love be our song and love our prayer, and love our endless story…” an excerpt from verse 4 of Awake, Awake and Greet the New Morn. 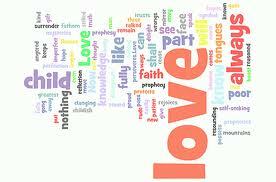 When I was in 5th grade, I memorized I Corinthians 13 (the “love chapter” of the Bible) at camp. I did it for the challenge — and because I was a geek– and (most of all) for the T-shirt! I grew up in a UCC congregation, which though not liberal, was certainly not fundamentalist. At camp that summer I first encountered the notion that I must pray to be “saved” and “take Jesus into my heart” otherwise I would go to hell. Ironically, this initial exposure to fear-based religion also helped to kindle in me a fervent love for scripture. It also introduced me to an incredibly passionate love for Jesus: when we sang those Gospel songs, we sang with all our hearts! It’s hard to explain, but this singing filled a deep yearning in me. This “ancient history” came to mind this evening in the midst of a Bible study on I Corinthians 13. Studying this text reminded me that love– love for ourselves, love for our neighbors and families, love for the world, passionate, fervent, love– is complex and imperfect, and absolutely most important thing. Advent is, above all, about the way that the love of God comes to be born among us, and for us, and within us. Advent is the story of a love that is big enough and wide enough and deep enough to embrace us all.